With thousands descending on Ferguson today to demand justice for Michael Brown, a creator of #BlackLivesMatter thinks now may be the time to win long-term victories. 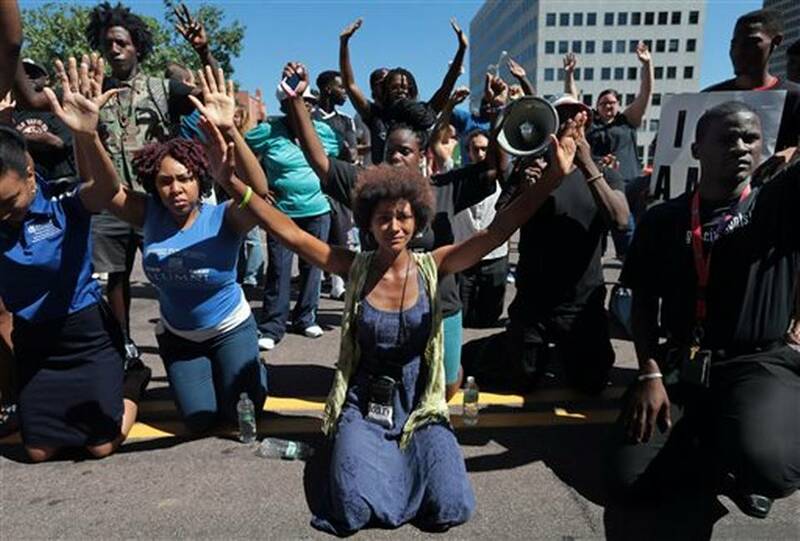 Thousands of activists are expected to converge on Ferguson, Missouri starting Friday, October 10, for a “Weekend of Resistance” to support the ongoing protest movement that arose in the wake of the police killing of Michael Brown on August 9. Ferguson October, as the initiative is called, was organized by a coalition of recently formed and longstanding community organizations in the St. Louis area, including Hands Up United, The Organization for Black Struggle and Missourians Organizing for Reform and Empowerment (MORE). Beginning Friday with a march to the office of Bob McCulloch, the attorney charged with prosecuting the police officer who shot and killed Brown, the weekend will include numerous rallies, protests, political forums, and teach-ins, and will culminate with planned civil disobedience actions on October 13. Alicia Garza is one of the organizers working on the ground in Ferguson with the wave of new activists who have taken to the streets in the wake of Brown’s killing. Based in Oakland, California, Garza is the Special Projects Director for the National Domestic Worker’s Alliance (NDWA). Garza is a co-creator of #BlackLivesMatter, a “political project” and online platform that aims to confront anti-black racism and reaffirm black humanity. Garza is also a member of LeftRoots, a “national formation of Left social movement organizers and activists” seeking to build socialism in the 21st century. After returning to the Bay Area, Garza received a call from the coalition organizing Ferguson October asking for support. On September 28, she returned to Ferguson, where she spoke with In These Times.